The wrist joint is formed by the two bones from the forearm (the radius and ulna) and eight smaller bones. These ten bones together form several different joints with very complex motion. The most commonly fractured bone in the wrist is the radius. This occurs most commonly from a fall on an outstretched hand. Fractures of the end of the radius (Distal Radius Fractures) can also occur from crush injuries and high energy trauma such as car crashes. In people with osteoporosis (weak bones), distal radius fractures can happen with a simple fall from standing. 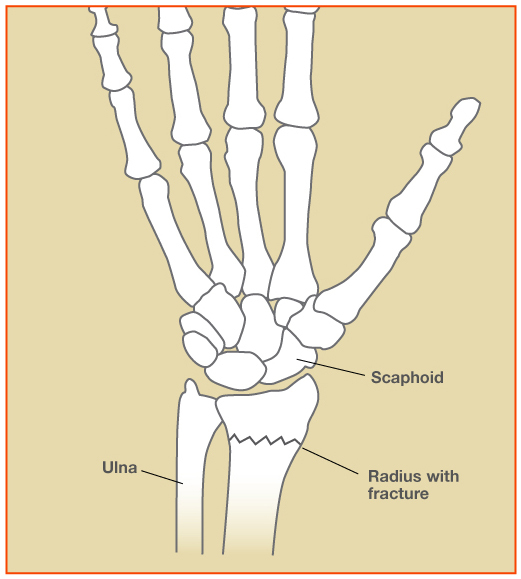 A fracture of the end of the radius will cause significant pain, swelling, and sometimes obvious deformity. Patients will usually notice bruising that shows up over the first few days. An evaluation in the emergency room or in the orthopedic surgeon’s office is important to look for associated problems such as open fractures, nerve injury, tendon injury, and joint dislocations. Xrays and occasionally CAT scans will be used to diagnose which bones are fractured, how complex they are, and what the necessary treatment will be. Many distal radius fractures are minimally angulated or displaced and will do well when treated in a cast for immobilization. The length of time needed for casting depends on type of fracture, patient age, and health of the patient. The cast can usually be just on the wrist and forearm leaving the fingers and elbow free. Healing of the bone usually takes 2-3 months with return of strength and function within 4-6 months after injury. Distal radius fractures which have significant displacement or angulation, are open (compound) fractures, or have associated nerve/tendon injury may need operative treatment. In the case of open fractures, surgery needs to be done in the first 12-24 hours to decrease the risk of infection. Otherwise, surgery can usually be delayed up to 2-3 weeks if necessary. In surgery, an orthopedic surgeon can realign the bone and then fix it in place with pins, a plate and screws, or an external fixation device depending on the type of fracture and severity. This usually requires general anesthesia and can be done as an outpatient without an overnight stay in the hospital. After surgery, casting or a removable splint are typically used to immobilize the wrist. If pins or an external device are used, they will need to be removed once healing has progressed. 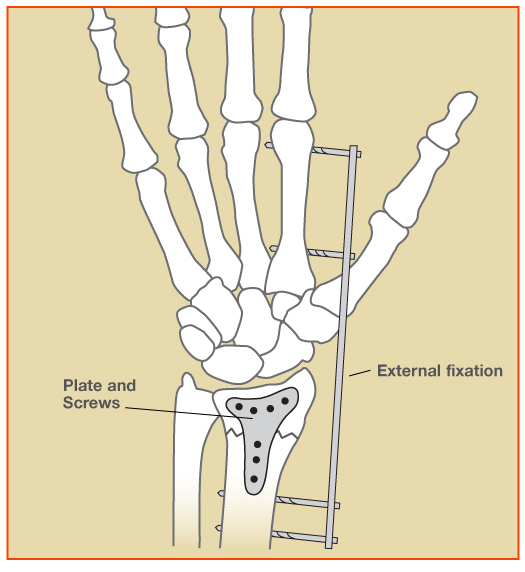 Plates and screws are usually left in the arm forever and don’t usually cause a problem. Physical therapy is occasionally necessary for range of motion and strength. Bony healing still takes 2-3 months to occur in most situations. Call Dr. Murch today at 715-847-2382 in order to be evaluated.